So this isn't really brain surgery or some novel idea - but given all of the high priced "adult sodas" I have been seeing at delis and Whole Foods around town I thought I would address it. Companies like Izze Sparkling Juice and Gus Grown Up Soda have introduced all natural fruit/soda drinks to the adult market. Marketed as an alternative to the Coke, Pepsi, and Snapples of the world and loosely based on the popularity of gingerale, adult sodas focus primarily on providing sophisticated flavors like clementine, pomegranate, and meyer lemon. They definitely do taste good - but the price can be somewhat high compared to the @home alternative. 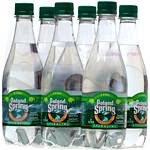 Instead of buying at the store - make your own version at home with good'ole Poland Spring Sparkling Water or any other generic brand + any fruit juice of your choice. 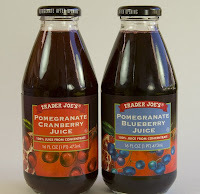 Popular combinations include mango nectar, apple juice, pomegranate, blueberry or triple berry - organic 100% natural versions are of course widely available at Trader Joe's. I like my drinks a little more diluted so I usually mix the juice and sparkling water at a 1/3 juice to 2/3 sparkling water. If you want it sweeter - just increase your proportion of juice.